Visit Right Start online at RightStart.com which is one of the largest national specialty retailers of juvenile products for infants and young children. Right Start carries a carefully selected assortment of the finest quality strollers, car seats, developmental toys, books, videos, music, nursery accessories, and home safety items, plus a complete assortment of care products. Save on your next purchase from RightStart.com with Right Start discounts, Right Start coupons and Right Start savings found here on 58Coupons.com. Save $10 on your next order of $50 or more from RightStart.com when you sign up for their newsletter. Click link for details. 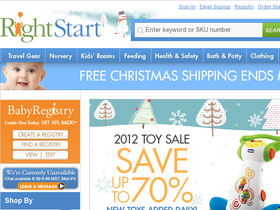 Right now when you create a baby registry with RightStart.com, you'll get 10% back on your purchase.